Over at our house we are prepping for Easover. That’s right. I just made up a word – and a holiday. I mashed together Easter and Passover into one wonderfully fantastic holiday focused on celebration, food, more food, and gathering friends and family to share in the food and celebration. Easover is all about the fun side of Easter, full of dyed eggs, chocolate bunnies, and maybe an egg hunt or two. It’s also about learning more about Jewish tradition and gathering together for the epic Passover meal. You see, I was raised Lutheran, (which didn’t really go well), and my husband is part Jewish. He grew up in an East Coast Jewish family but didn’t quite make it to being bar mitzvah-ed. So, together, we are a somewhat non-religeious-but-full-of-traditions family. Basically, we’re making it up. While living over on the East Coast, we had the wonderful opportunity to celebrate Passover with his family and experience a traditional Seder dinner, which was really special. But, with a tot, and no family in the area here in California, we’re winging it. My mom sent a fantastic box full of Easter goodies, and the tot and I will be naturally dying eggs later today, but we wanted to include some our favorite Passover eats with our Sunday celebration. If you haven’t had it, kugel is a sweet or savory dish made from egg noodles, eggs, creamy stuff, more eggs, and something sweet or savory. I decided to add my own spin on things – because it’s my own made up holiday, right? 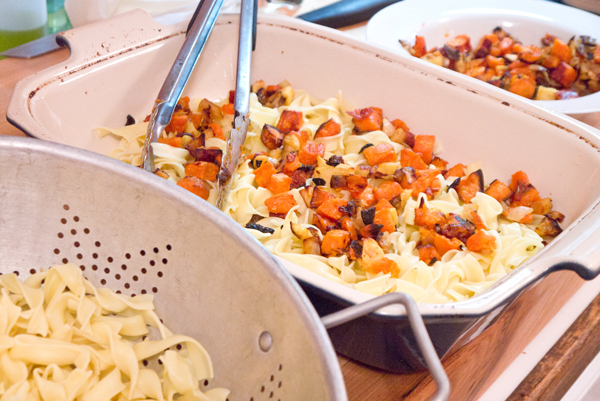 – and make a sweet, savory kugel with roasted sweet potatoes and apples. And this is so good, and really simple to toss together, perfect for whatever you’re celebrating! 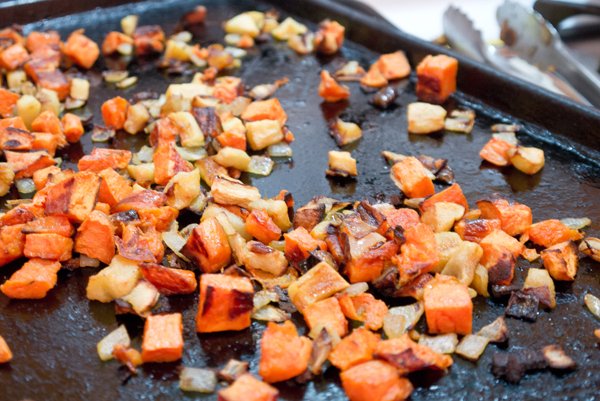 Pre heat your oven to 425 F and start chopping your sweet potato, apple, and onion. You want everything to be about a 1-inch dice, so take your time. Once things are chopped nice, toss on a sheet pan and drizzle with the vegetable oil. Pop things in your hot oven and let roast for about 15-minutes. Give things a toss and let roast for an additional 15 minutes – or until the edges start browning. After taking them out of the oven, reduce the temperature to 350 F.
While things are cranking in the oven, fill a bit stock pot with water and bring to a boil. Simmer the egg noodles for about 8-10 minutes, or until they are just cooked through. Give them a drain and let them hang out while the sweet potatoes, apples, and onions are roasting. Now crack those eggs into a medium mixing bowl, add the sour cream and milk, and give a whisk. Sprinkle in the thyme, pepper and salt and set to the side. Get out a 9×13 inch casserole and lightly grease with vegetable oil. 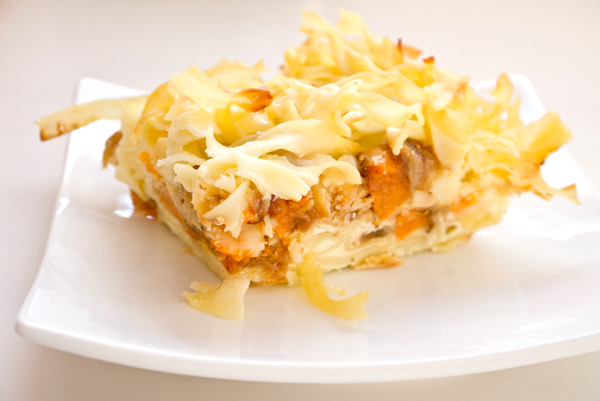 To create the kugel make a layer of egg noodles in the casserole and then top with a sprinkling of the sweet potato mixture, then layer with noodles, a sprinkling of potatoes, noodles, potatoes…. Once you’re out of noodles and sweet potatoes, evenly pour the egg mixture over the whole shebang. Use a big spoon to gently press the noodles into the milk mixture, and then sprinkle with additional salt and sugar. Dot the top with butter. Pop your kugel into the hot oven for 45-60 minutes, or until the top starts browning. Let sit for 20-minutes before serving, or let chill in the fridge over night and enjoy at room temperature the next day – kugel is tasty hot or cold.